In the Central Coast town of Watsonville, Pinto Lake City Park is a fixture in the life of many locals, including 20-year-old Juan Perez. He's been fishing off the jetty at the southern end of the lake since he was 8 years old. “I come out here whenever I can,” Perez said. He usually fishes for sport--catch and release--except late this summer when he caught more than 100 pounds of carp, winning Watsonville’s “Carpageddon” competition. The monthly $50 prize to the angler who removes the most carp from the lake is about all Watsonville can afford, to address the lake's big problem. 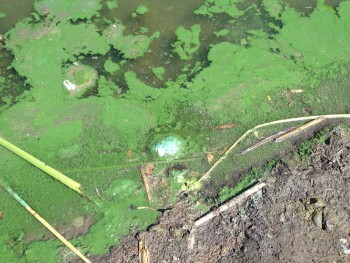 Pinto Lake is plagued with chronic blooms of a toxic blue-green algae called cyanobacteria. The algae feed on phosphorus from decades-old deposits of sediment in the lake. Farm fertilizers and leaky septic systems are also contributors, and the bottom-feeding carp stir that phosphorus up into the lake waters. 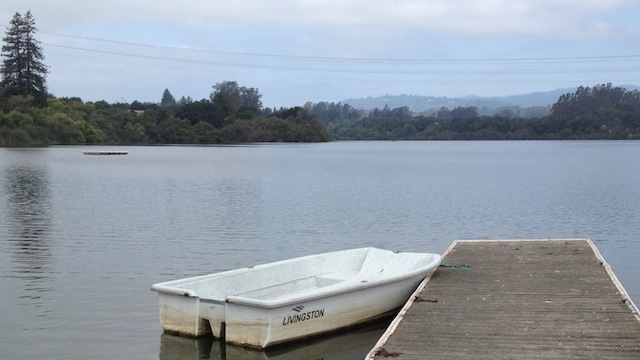 “So if we can reduce the amount of carp in the lake we can reduce the amount of phosphorus in the water column,” said Robert Ketley, a senior utilities engineer with the city of Watsonville. The algae stay green while they're floating on the surface of the water and then turn blue where they've dried on shore. “The problem really manifests in the fall months, and that’s when you come down here and the lake will look luminescent green and will have an odor that you will either distinguish as 'gym bag' or 'manure,'” Ketley said. The algae produce a toxin called microcystin that when touched or ingested can cause effects ranging from nausea to liver damage. The California health limit for the toxin is 0.8 parts-per-billion. Between 2009 and 2012, Pinto Lake averaged 84 ppb: 100 times the health limit. And one sample back in 2007 showed nearly 2.9 million ppb of microcystin. That’s the highest level of that toxin ever recorded in California: more than 3 million times the health limit. A new study sponsored by the National Wildlife Federation ranks Pinto Lake’s algae among the worst in the nation. The blooms have been linked to the deaths of birds, fish and even sea otters in nearby Monterey Bay. That’s because the lake’s waters eventually flow into the Pajaro River, which empties into the bay. Once Ketley and a researcher showed symptoms of exposure themselves. Otherwise there are no documented cases of people getting sick from the slime. 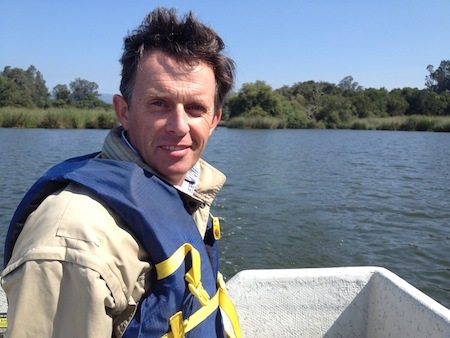 Ketley says the algae will get worse when the rainy season kicks in. That’s when runoff from nearby agricultural fields and neighborhoods gives the biggest boost to phosphorus levels in the lake. The city plans to educate homeowners and businesses in the watershed about the effects of runoff, but that will only go so far. It’s also considering treating the lake with a chemical compound called alum. “You put alum into the lake," Ketley said, "it binds up the phosphorus in the water column, and you create a barrier on the bottom of the lake, over the sediment, so that the phosphorus from the sediments can’t get up in the water column." He says the alum treatment will cost several hundred thousand dollars. It’s money Watsonville does not have. The city hasn’t recovered from the economic downturn, when it had to cut staff and services. So Ketley applied for a grant from the State Water Resources Control Board. He says Pinto is the perfect-sized laboratory lake for other California communities. “One of the things I really feel strongly about," Ketley said, "is I want to make sure people see this as an opportunity to have a success story rather than doom and gloom--‘Oh no, toxic lake, bad situation.’ We can fix this." McQuade and other community members say it must be fixed. They recently formed a group called Friends of Pinto Lake. “When you think of how hard we work to save a redwood, maybe 300 years old," McQuade offers for perspective, "this is 8,000 years old, so we have to do it." 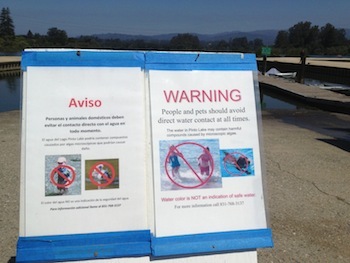 It could be months before Watsonville knows if it will get any state money to help clean up the algae and preserve this treasured lake. Krista Almanzan reports for public radio station KAZU in the Monterey Bay Area. She has also produced stories for NPR and KQED.